In a few years, we might all be asked where we were when Kim Kardashian shared video of Kanye West and Taylor Swift's phone call that happened before West released his song "Famous." In Kardashian's GQ profile this past June, she said she was upset with Swift's negative reaction to the lyrics of the song, because West spoke to her about it previously and she approved. Meanwhile, Swift maintains that she didn't approve the part of the song where he refers to her as "b*tch." This is the kind of stuff pop culture legends are made of. While I watched the Snapchat videos, I laughed, got uncomfortable, and gasped out loud, but I also noticed and wondered about another small detail: Who was the bearded man next to West in Kardashian's Snapchat? For just a brief moment in the beginning of the recording, the shot moves up from West's phone and we see a quick, grainy flash of a man lying down, seemingly unbothered and unimpressed by this pop culture moment happening before him. Or maybe he was sleeping? 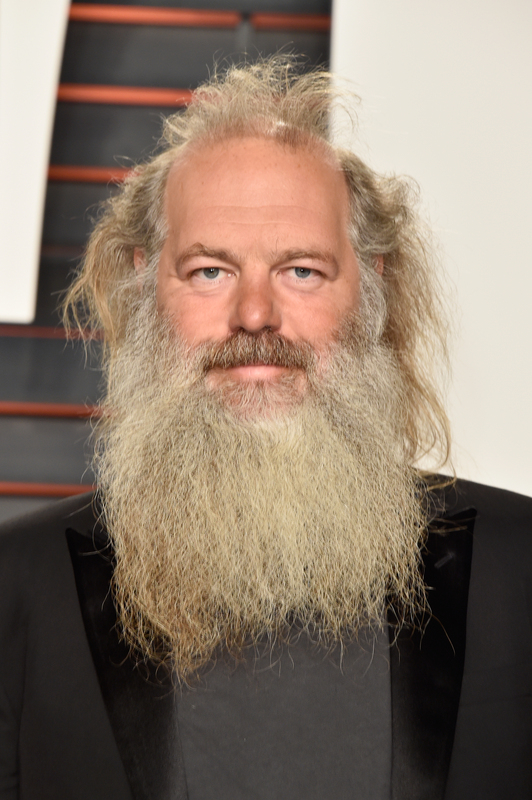 Either way, he had better things to do, because it turns out, this bearded man is none other than music producer legend himself Rick Rubin, which makes this all the more funny. As the Twitter world was exploding when Kardashian's Snapchats first got released, a few people were eager to figure out who the man was. Was he a ghost? Why didn't he realize the magnitude of this? Well, Rubin is a music producer who has worked with virtually every big artist from every single genre, from Slayer to Adele. Rubin co-founded Def Jam Records when he was still a student at New York University, and eventually joined forces with Russell Simmons. They parted ways in the late '80s, and Rubin moved to Los Angeles to start American Recordings, working with many hard rock and metal acts, but never losing his hip- op roots throughout the years. In 2013, Rubin famously helped West produce and "strip down" his Yeezus album, only two weeks before its release, so he knows a thing or two about working with West. Rubin told Rolling Stone of their time in the studio, "We ended up working probably 15 days, 16 days, long hours, no days off, 15 hours a day. I was panicked the whole time." Somehow, he still signed on to help produce some tracks on The Life of Pablo, which explains why he was there, in the studio with West, chilling on the couch. In fact, The Independent published an entire article in February about Rubin's propensity to chill hard in the studio, titled, "A Brief History of Rick Rubin Lying Down," which I now wish I would've thought of, to be honest. So it turns out that Rubin lying down is a thing that just happens in the music biz, and now everyone knows for sure that Rubin is just too cool for any of these shenanigans. Cheers to Rick Rubin: My summer goals, unbothered goals, nap goals, and lounging goals.